Access to unstructured play is affected by the emphasis placed on structured extra-curricular activities and academics, which are often prioritized before play. In addition, municipalities and school boards implement strategies to reduce the likelihood of all play-related injuries, which can constrain children’s play experiences and associated benefits. These short-term approaches work against the longer-term benefits of providing children opportunities to explore spaces that provide rich play experiences.‡ Access to these play opportunities can also be limited by the availability of natural and built play spaces in urban and rural environments, and the influence of the child’s economic status, colour, gender, religion, culture or ethnic origin. Recognize unstructured play as a critical part of healthy child development and adopt a mandate that clarifies this importance. Develop and strengthen policies that encourage unstructured outdoor play in all seasons and related weather conditions. Strengthen investments to enhance and protect natural and inclusive play spaces within walkable distances of where children live and learn. Amend educators’ collective agreements to permit additional supervision time to support unstructured play for recess. Reform Joint and Several Liability to require defendants to only pay the percentage of damages for which they are found liable. Influence the use of risk-benefit assessment processes to mitigate play-associated liability concerns for child care providers and school boards. Establish a community-wide approach to increasing access to unstructured play that establishes a common vision and addresses community concerns. Enhance community planning and design standards to increase and improve all-seasons play spaces and parks within existing communities and new residential or mixed-use developments. Identify and address gaps in access to safe places for unstructured play by location and socio-economic status. Influence the use of risk-benefit assessment processes to mitigate play-associated liability concerns for municipalities. Strengthen partnerships with key organizations to advocate for and provide evidence about the importance of unstructured play for healthy child development and increase capacity to implement healthy public policy solutions. Shift the knowledge, attitude, beliefs and behaviours of parents and caregivers concerning unstructured play by using marketing, communication and social media approaches. Develop a position in support of unstructured play that uses a risk-benefit approach to balance injury prevention and childhood development (physical, mental, cognitive and social) benefits. Collect, monitor and report play space child injury data, including exposure and demographic information, to inform standards and policy development that can be applied across provinces. Conduct research on the longitudinal benefits of unstructured play. Adopt Universal Design Principles such that a variety of play elements are available to individuals of all abilities, including those that provide sensory and tactile experiences. Add loose parts** and natural elements to manufactured play facilities, and develop dedicated natural play spaces that include loose parts. Amend Playground Standard Z614 to be more considerate of child development needs and acceptable risk-taking in play, including the adoption of a risk-benefit assessment process. CPHA recognizes the need for collaborative decision-making based on a risk-benefit assessment approach that integrates the views of children and youth into the process. These decisions must be supported by adequate funding for natural and built play space development and maintenance. Also, critical to the success of these recommendations is the development and implementation of training and education on the importance of unstructured play that extends beyond traditional stakeholders. It should be tailored to the needs of parents and those who are developing, maintaining and providing access to unstructured play, and developing, supporting, and maintaining interesting, challenging play spaces for children. Unstructured play is the business of childhood. It is an integral part of every child’s healthy development and is embedded as Article 31 of the Convention on the Rights of the Child.3 Children and youth of all abilities have an equal need for time, appropriate space and opportunity to engage in quality play.3 Types of unstructured play can include: play at heights; play at speed; play with loose parts; rough-and-tumble play; and play where the children can “disappear” or “get lost.”†† Organized sports or screen-time (time spent in front of the television, computer, gaming console, tablet, smartphone, or any other electronic equipment) are not considered unstructured child-led play. Societal pressures and parental attitudes toward supervision and overprotection have increased while children’s independence has decreased. While supervision is needed for infants and toddlers, there is a need to balance these concerns against the benefits of unstructured play as children develop, especially those aged 6 to 12. For the latter group, “helicopter” or hyper-parenting can be perceived as a loss of trust between parents and their children.20 It may have a detrimental effect on children’s mental wellness, resulting in psychological problems and reduced self-confidence.21 Hyper-parenting can limit a child’s ability to freely engage in unstructured, child-led play. For example, children’s independent mobility (the distances they are allowed to travel without adult supervision)22 has decreased between generations.23,24 Independent mobility directly affects a child’s access to play, as children who can travel greater distances are more likely to meet and play with peers,25 be more physically active, and play outdoors more regularly.5 Lack of independent mobility also affects a child’s ability to walk or cycle to school. Steps are necessary to inform and educate parents and caregivers of the benefits of unstructured play, the harms associated with hyper-parenting and the importance of child independence in play. Consideration should be given to measures that reframe parental perceptions of risk. School boards and municipalities often face financial limitations that restrict access to unstructured play opportunities. Building, maintenance and programming costs specifically for natural playscapes can limit rich play space development. Remote or rural locations, in particular, are faced with greater challenges accessing funding to develop diverse play environments than are urban school boards or municipalities. Similarly, funding for play spaces may come from fundraising events, whereby low socio-economic status communities have less opportunity or resources available to them for such events. Municipal governments’ fears of injury and the likelihood of encountering a legal claim (often driven by parent or caregiver complaints) affect their decision-making.26 Such decision-making limits play when, for example, play apparatus, structures, activities or opportunities (i.e., prohibiting tobogganing hills) are removed in order to reduce the likelihood of injury. The challenge, however, is to separate the consideration of safety (the elimination of hazards from the site) with access to challenging play (the ability for children to test their limits). Play spaces should be ‘as safe as necessary’ not ‘as safe as possible.’ Municipalities have implemented by-laws to restrict play, including fines for climbing trees, bans on street hockey or street play, or permits required to access park space. These safety requirements are often implemented without consideration of child development needs. As a result, children’s engagement in diverse types of play is limited. Similar challenges exist for School Boards; however, their situation is further complicated as provincial and territorial Education Acts include a requirement for a duty of care similar to that of a “prudent parent” for school officials. A further challenge emerges when the requirements prescribed in provincial and territorial Child Care and Early Years Acts are compared to those of Education Acts. The different requirements can challenge the delivery of programs that promote unstructured play, especially when the two facilities are co-located. Consistent approaches should be developed to better align the implementation of the requirements found in both Education and Child Care Acts. Contributing to these concerns is the issue of Joint and Several Liability, where an injured party is permitted to recover up to 100% of the compensation awarded from the party who is able to pay, regardless of the degree to which that party is found to be negligent. Steps should be taken to reform Joint and Several Liability so that that the compensation paid towards an injured party is proportional to the degree to which the defendant was found to be negligent. Restriction or prohibition of outdoor play or recess periods during inclement weather. Steps should be taken to withdraw these restrictions. A risk has the potential for a positive or a negative outcome. The potential negative outcome is not hidden and the risk-taker has the opportunity to recognize and assess the challenge. A hazard is a situation where the potential for injury is hidden from the individual and there is limited opportunity to navigate the situation.33 The challenge is then to remove the hazards while permitting those involved in the activity the opportunity to accept the level of risk with which they are comfortable. The Canadian Standards Association’s (CSA) standard for “Children’s Play Spaces and Equipment” (CAN/CSA-Z614) provides a foundation for playground safety that minimizes the likelihood of serious and/or life-threatening injuries, but is not intended to address child development needs. It is voluntary and its intended use is not specified. Therefore, its application is determined by the user. Daily practices associated with play spaces, however, are strongly influenced by the Standard, as they are often applied as a minimum safety requirement or safety guideline by decision-makers. As such, the prevention of all injuries may be valued over the social, psychological and physical benefits of unstructured play. As a result, play structures that are designed to meet the standard may lack challenge, and place limitations on loose parts play. An alternative to this methodology could be the use of a risk-benefit assessment approach that balances the need for hazard identification and removal with the benefits of unstructured play to permit the establishment of interesting play spaces. A second approach may be to use the methodology incorporated in the European or Australian Playground Standards where playgrounds that do not conform to safety standards may be permitted for use should they not present a hazard to the users. Children who play with loose parts are more active and more likely to interact with their peers than they would on playgrounds with fixed equipment.26 Loose parts play may also help children become more social, creative, and resilient.34 Similarly, playgrounds designed with natural elements encourage children to play longer and in more engaging ways than contemporary play structures,1,35 as children tend to prefer natural outdoor play environments, and natural playgrounds may provide more enjoyable physical activity experiences for children.4 However, guidelines are lacking to support the development of such environments. excluding children with non-physical disabilities. The application of Universal Design Principles††† or the approach of Herrington and Brussoni35 could improve accessibility for and meet the play needs of all children. Indigenous communities face strengths and challenges related to unstructured play. Challenges may include limited access to land, limited community infrastructure, aging facilities, competing community priorities, and the effects of colonization that have resulted in a variety of related outcomes. Strengths include cultures and traditions that support unstructured play, geographical benefits with access to water and land (although for some communities this remains a challenge), values that support unstructured play, and Elder teachings. Research related to unstructured play and the information consulted to make play-related decisions can be limited by the inconsistent use of the term play and its derivatives, such as risky play, nature play, outdoor play and unstructured play. This lack of consistent terminology and definitions poses difficulties with the consistent measure of effects and comparison of outcomes. balancing of the need for quantitative data with that for qualitative assessment and evaluation, as a means of capturing the perspectives and experiences of children, parents and caregivers. Unstructured play happens when children follow their instincts, ideas and interests without an imposed outcome. It provides the opportunity to develop physical, mental, emotional and social health while contributing to risk management skills and resilience. These skills provide the foundation for children’s success across the life course. Access to unstructured play, however, has become limited and action is needed to reverse this trend. The recommendations propose a variety of actions that will help to improve children’s access to unstructured play. Canadian Public Health Association (CPHA). Children’s Unstructured Play Position Statement. March 2019. 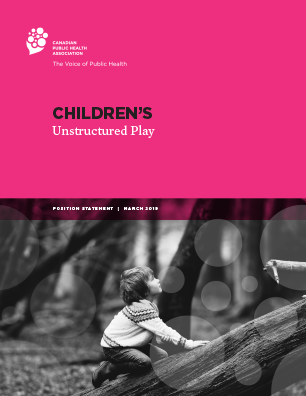 Available at https://www.cpha.ca/childrens-unstructured-play. * This position statement was prepared as a result of our project to develop a policy toolkit to support children’s access to unstructured play. We acknowledge and thank the Lawson Foundation for its financial support to develop the toolkit. † The term unstructured play does not have an academic definition, but has come to be used as a generic term to represent child-led play that takes place preferably outdoors but also indoors, and includes the concept of risky play. Its use was developed to reflect the concerns of decision-makers regarding the use of the term “risky” to describe play. ‡ CPHA recognizes that education departments have been implementing play-based learning as a preferred approach for early years education that offers a continuum of play options that includes child-led play and can become more teacher-led. We appreciate the benefits of this approach for learning and acknowledge that this is an important and complex relationship. Children also require time outside the school setting for unstructured play, preferably outdoors but also indoors, where they can self-direct play with or without the presence of adults (when age-appropriate) and without an imposed outcome, to meet their development needs. § Decision-making to increase access to play can be supported by CPHA’s toolkit. **Loose parts are materials that can be moved, carried, combined, redesigned, lined up, and taken apart and put back together in multiple ways. They are materials with no specific set of directions that can be used alone or combined with other materials (Outdoor Play Working Group. (2017)). †† Definition adapted from Sandseter EBH. Characteristics of risky play. Journal of Adventure Education & Outdoor Learning 2009;9(1):3–21. §§ These fears include, for example, the child injuring themselves as a result of play or their being abducted. *** This voluntary annex establishes minimum accessibility guidelines for newly constructed and redeveloped play spaces. ††† The principles of Universal Design can be found here. Tremblay MS, Gray C, Babcock S, Barnes J, Bradstreet CC, Carr D, et al. Position Statement on Active Outdoor Play. ParticipACTION, 2015. (Accessed July 10, 2018). Council of Chief Medical Officers of Health (CCMOH). The Council of Chief Medical Officers of Health Supports the Position Statement on Active Outdoor Play. Pan-Canadian Public Health Network, 2018. (Accessed July 10, 2018). Piaget J. 2007. The Child’s Conception of the World: A 20th-Century Classic of Child Psychology (2nd Ed.). New York, NY: Rowman & Littlefield Lanham, 2007. Brussoni M, Gibbons R, Gray C, Takuro I, Sandseter EBH, Bienenstock A, et al. What is the relationship between risky outdoor play and health in children? A systematic review. Int J Environ Res Public Health 2014;12(6):6423–54. ParticipACTION. The 2018 ParticipACTION Report Card on Physical Activity for Children and Youth. ParticipACTION, 2018. (Accessed July 10, 2018). Brussoni M, Olsen LL, Pike I, Sleet D. Risky play and children’s safety: Balancing priorities for optimal child development. Int J Environ Res Public Health 2012;9(9):3134–48. Engelen L, Bundy AC, Naughton G, Simpson JM, Bauman A, Ragen J, et al. Increasing physical activity in young primary school children—It’s child’s play: A cluster randomised controlled trial. Prev Med 2013;56(5):319–25. Gray C, Gibbons R, Larouche R, Sandseter EB, Bienenstock A, Brussoni M, et al. What is the relationship between outdoor time and physical activity, sedentary behaviour, and physical fitness in children? A systematic review. Int J Environ Res Public Health 2015;12(6):6455-74. Sandseter EBH, Kennair LEO. Children’s risky play from an evolutionary perspective: The anti-phobic effects of thrilling experiences. Evol Psychol 2011;9(2):257–84. Lavrysen A, Bertrands E, Leyssen L, Smets L, Vanderspikken A, De Graef P. Risky-play at school. Facilitating risk perception and competence in young children. Eur Early Child Educ 2017;25(1):89-105. Panksepp J. Can play diminish ADHD and facilitate the construction of the social brain? J Can Acad Child Adolesc Psychiatry 2007;16(2):57–66. Strong WB, Malina RM, Blimkie CJ, Daniels SR, Dishman RK, Gutin B, et al. Evidence based physical activity for school-age youth. J Pediatr 2005; 146(6):732-37. Centers for Disease Control and Prevention. 2010. The association between school based physical activity, including physical education, and academic performance. U.S. Department of Health and Human Services. (Accessed July 10, 2018). Williamson D, Dewey A, Steinberg H. Mood change through physical exercise in nine- to ten-year-old children. Percept Mot Skills 2001;93(1):311-16. Sandseter EBH. Children’s risky play in early childhood education and care. ChildLinks 2011;3:2-6. Little H. Thrills (and spills?) in the playground: Describing children’s physical risk taking behaviour during outdoor play. 18th European Early Childhood Education Research Association (EECERA) Annual Conference, Stavanger, Norway, 3-6 September 2008. Armitage M. Risky play is not a category–it’s what children do. ChildLinks;3:11-14. Rosin H. The Overprotected Kid. The Atlantic April 2014. (Accessed July 10, 2018). Holmbeck GN, Johnson SZ, Wills KE, McKernon W, Rose B, Erklin S, et al. Observed and perceived parental overprotection in relation to psychosocial adjustment in preadolescents with a physical disability: the mediational role of behavioral autonomy. J Consult Clin Psychol 2002;70(1):96-110. Schoeppe S, Duncan MJ, Badland H, Oliver M, Curtis C. Associations of children’s independent mobility and active travel with physical activity, sedentary behaviour and weight status: a systematic review. J Sci Med Sport 2013; 16(4):312-19. Shaw B, Watson B, Frauendienst B, Redecker A, Jones T, Hillman M. Children’s independent mobility: a comparative study in England and Germany (1971-2010). Policy Studies Institute, 2013. (Accessed July 10, 2018). Janssen I, Ferrao T, King N. Individual, family, and neighborhood correlates of independent mobility among 7 to 11-year-olds. Prev Med Rep 2015;3:98-102. Prezza M, Pilloni S, Morabito C, Sersante C, Alparone FR, Giuliani MV. The influence of psychosocial and environmental factors on children’s independent mobility and relationship to peer frequentation. J Community Appl Soc 2001;11(6):435-50. Canadian Public Health Association (CPHA). Decision-Making Barriers to Accessing Unstructured Play: Key Informant Interviews. 2018. (Accessed July 10, 2018). Ontario Ministry of Education. The Kindergarten Program. 2016. (Accessed July 10, 2018). College of Early Childhood Educators. Early Childhood Educators’ Act. Standard III: Safety, Health and Well-Being in the Learning Environment Section C. (Practice) #6. 2017. (Accessed July 10, 2018). Ginsburg KR. The importance of play in promoting healthy child development and maintaining strong parent-child bonds. Pediatrics 2007;119(1):182-91. Public Health Agency of Canada. Report from the Canadian Chronic Disease Surveillance System: Mental Illness in Canada, 2015. 2015. (Accessed July 10, 2018). Hüttenmoser M. Children and their living surroundings: Empirical investigation into the significance of living surroundings for the everyday life and development of children. Child Environ 1995;12(4):403–13. Jarrett OS. A Research-Based Case for Recess. US Play Coalition, 2013. (Accessed July 10, 2018). Brussoni M, Brunelle S, Pike I, Sandseter EB, Herrington S, Turner H, et al. Can child injury prevention include healthy risk promotion? Inj Prev 2015; 21(5):344-47. Bundy AC, Luckett T, Tranter PJ, Naughton GA, Wyver SR, Ragen J, et al. The risk is that there is “no risk”: a simple, innovative intervention to increase children’s activity levels. Int J Early Years Educ 2009; 17(1):33–45. Herrington S, Brussoni M. Beyond physical activity: The importance of play and nature-based play spaces for children’s health and development. Curr Obes Rep 2015; 4(4):477-83.